A book by Sakata Eio, translated by Bob Terry. 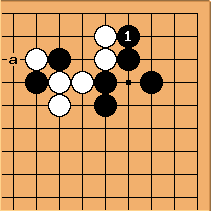 It features 61 models or lines of play (suji) and the way to use them skillfully (tesuji). This book has been discontinued by Yutopian, and is now out of print. PJTraill: Could someone please also its approach to anti-suji (with a link) (and remove this request)? Dieter: I used to be very fond of this book but now, after an n-th reading it has dawned upon me how this book lacks the most basic idea of structure. It's exemplary in the old discussion whether we can best learn from examples or from structured theory. The book certainly is very inspiring, if only inspiring to bring some structure into the ideas. 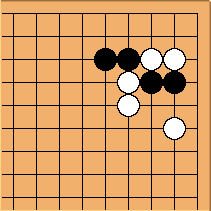 The essays in between are as entertaining and inspiring as those in Killer of Go by the same author, but the introduction on the difference between suji and tesuji could have been less academic. Naustin: I have got to disagree with you on the last bit Dieter. As I have already noted else where I feel this explanation is very good. Not only does he explain suji and tesuji but shape also in a very clear and economical manner by showing the general nature of suji, and the showing how shape and tesuji are basically mirrors of one another. 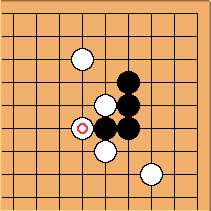 When a good move is found for defense it is good shape, when the same move is found on offense it is a tesuji but these are both examples of the general suji. The other aspect of Dieters claim about the structure of the book remains to be seen. I do look forward to spending a little time with this book though. Arjen: I just received a copy from Samarkand. It appears to be a good book. The introduction is clear enough. 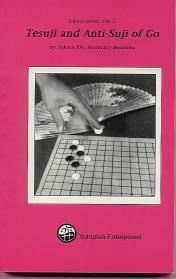 The book focuses on basic lines of play, with a wide range of applications. The emphasis is on case by case analysis. Each Suji receives quite a thorough analysis, and the short essays contain valuable suggestions for all beginners. I'd like to compare the book with Tesuji by James Davies, which takes a purpose-orientated approach, thus providing more of a framework, but is less exhaustive. I feel that, if the categorization provided by Davies no longer suffices, Sakata's book is the place to start looking for the right Suji. HughJfan: after spending a long time tracking down a copy of this (in 2009) I finally got one. How does it compare to the current range of Tesuji books? Arjen's comments above ring true for me too, but I want to add that relative to the Fujisawa Tesuji dictionary set (I've got all of them, this and James Davies' book), this is more readable, or rather targeted at a easier level - it seems (or maybe just feels that way because there's less pages). 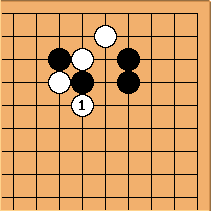 After reading Tesuji and Anti-suji some aspects of the Fujisawa set made more sense, for example. One thing that caught my attention is that the author comments that this book will aim at teaching useful general principles rather than a series of impressive examples (as far as I remember). Without knowing the details I would guess that both were published in Japan around the same time so I do wonder if you can take it as a criticism of the Fujisawa method..
KoKs: I have been tracking down a copy as well probably for like 3 years. Still no avail. Could you tell me where you got your copy? Thank you in advance. HughJfan: sorry about the delay, I'm not sure when that question was posted. I found my copy on Amazon.ca, though www.bookfinder.com was the thing I used to search for it. Also, www.bookfinder.com searches most pages (including Amazon) but not ebay. There are ways to set up automatic alerts for particular books but I was a bit obsessive and manually searched at least once a week. Perhaps now though I would consider it a good reason to buy an iPad (!) and the new e-book version, since if I paid $100 for a copy of T&AS that would be a big fraction of an iPad.